← Christmas Party on a Cruise – Why Not? New Year is one of the many holidays that bring excitement to many people, not only because we can now have the time to set and accomplish our new year’s resolutions but also because of the essence that this holiday brings – new beginnings, new life, a new journey, and new style. Perhaps, you are now considering having a new hairstyle, new home fashion, or a new outfit. As the New Year begins, many of us clearly want something new or something we’ve never seen and experienced before. Tiki Mermaid, a boat rental in Marina del Rey California has certainly prepared something new for you! In a yacht charter in California, a whole new experience is waiting for you. Famous for its beautiful harbor, Marina del Rey will inspire your New Year with its pleasant community of waters. This is a perfect way to celebrate the New Year with your family and friends. Besides the harbor, you can also enjoy the yacht amenities, foods, and drinks. If you want to experience something new this New Year, here it is! Eat, drink, and have fun, this New Year is going to be great. Whatever you want, we have it here. Say bon voyage to the year 2018 and savor the new beginning. 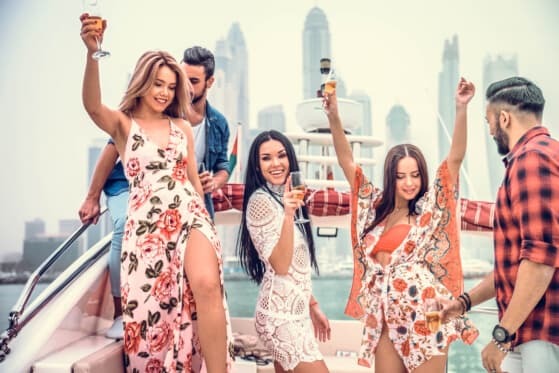 A party boat in California can make you feel renewed and set your mood ready for a new journey. Of course, let us not forget that the New Year isn’t just all about partying and hitting our New Year resolutions. It is also a perfect holiday to be grateful for this new transition in life as we spend this special day with the people we dearly treasure. This entry was posted in boat rental and tagged beautiful harbor, party boat, Yacht Charter. Bookmark the permalink.